Quick Fix Plus Unisex Synthetic Urine. Large 3oz Size. Formula 6.2. 100ct. Quick Fix Plus Synthetic Urine is the 3 ounce version of Spectrum Labs' patented laboratory urine that is conveniently premixed with urea. 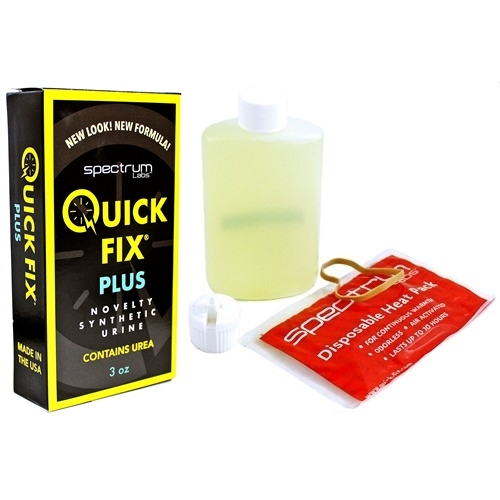 Quick Fix Plus is a unisex synthetic urine for use by either men or women. It contains ingredients normally found in urine and is balanced for pH, specific gravity, creatinine, and several other urine characteristics including urea. Quick Fix Plus comes with an attached temperature strip and heating pad to ensure the sample is at proper temperature. Quick Fix Plus contains three ounces of synthetic urine, more than the amount required by testing guidelines. Activate hand warmer prior to heating up Quick Fix Plus (may take 30-45 minutes for hand warmer to heat up). Shake the Quick Fix Plus bottle and microwave on high for 10 seconds. The temperature strip should display a green dot in a range of 94° – 100°F. If the bottle feels warm in your hand, but is not showing a reading on the temperature strip, the synthetic urine is overheated. Simply let it cool down gradually until you see a reading on the temperature strip. If the synthetic urine temperature is below 94°, heat again in the microwave for a few more seconds until you see the green dot on the temperature strip between 94° – 100°F. If you can’t microwave the Quick Fix Plus, simply attach the hand warmer to bottle at least 1 hour prior to your test. Shake bottle before and after heating and prior to pouring into cup. Do not transport or store this product in the flip top cap. Buyer/user assumes all responsibility and liability associated with these products. Buyer/user agrees to hold harmless all entities associated with this product. Not intended to violate any laws and is not for sale where prohibited. Buyer/user warrants product is legal in his/her jurisdiction. These products will not be shipped to residents of AR, FL, IL, KY, NJ, NC, SC, OR, TX if intended use is to influence a drug test. Buyer/user warrants that he/she is of legal age. We do not condone or encourage illegal activity or use of illegal drugs, especially on the job. You understand and agree that our products are not to be used for any illegal purposes, including use for lawfully administered drug tests. We shall have the right to refuse or cancel any such orders. This equipment and specimen may only serve as a control sample when conducting private home tests. Any reference to "passing drug test or screen" on this site refers solely to private home tests. All sales are final.